Royal Glasgow Institute, 1912., no. 352. Andrew Young's Scottish Fair is an exciting rediscovery. It can be considered his masterpiece and it's highly detailed observation indicates his skills as both a professional photographer and a miniaturist. Young lived and worked in Burntisalnd on the Fife coast and his output as a painter, photographer and civic historian chronicles the comings and goings of this vibrant community on the Firth of Forth. Young's reputation as a photographer spread far beyond his native town, and he was a significant contributor to prestigious publications such as Cassell & Company's Sights and Scenes in Scotland- a circa 1900 subscription-only publication in four volumes with around 225 large scale photographs, 'Dedicated by Special Permission to Her Majesty Queen Victoria'. His interests also extended to civic history. This manifested itself in his restoration of the panelling in the town's ancient parish church and his authorship of a History of Burntisland: Scottish Burgh Life More Particularly in the Time of the Stuarts (published in 1913). While living in Burntisland, Young studied art in the evenings at the Edinburgh School of Art, crossing the Firth of Forth on the Granton Ferry. There he won several medals and a legacy prize for his work. In 1885 he moved to Paris and studied under Bouguereau and Fleury. When his allowance ran out he returned to Scotland and re-opened his photographic studio in Burntisland. He continued to paint and exhibited in many institutions including the Royal Scottish Academy and the Royal Glasgow Institute. A Scottish Fair was exhibited there in 1912. 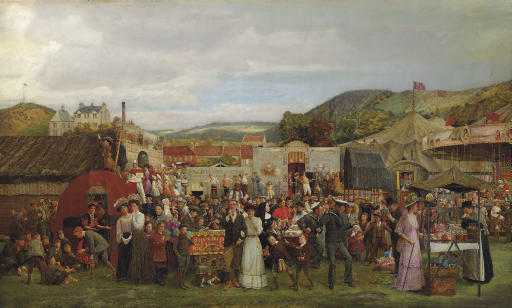 Other recorded works include The Magistrates' Seat (Burgh Chambers, Burntisland) which depicts the more prosperous inhabitants of Burntisland in 1906. .
A Scottish Fair, painted in 1910, depicts the annual summer fairground on Burntisland Links. Young is reputed to have created it as a wedding present for the couple pictured in the centre of the composition looking directly towards the viewer, surrounded by their friends and family. Please note that the provenance for this lot should not read Kirkcaldy Museum and Art Gallery. We are grateful to Iain Somerville at www.burntisland.net for his help in preparing this catalogue entry.